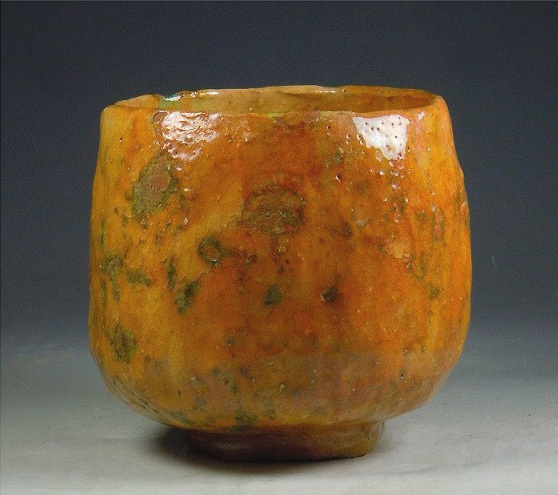 We have recently acquired this dramatic tall red raku chawan (tea bowl) with a well-placed ash glaze drip that is almost calligraphic in nature. The bowl is by Mokukian (a tea master?) for his own use, and the box is inscribed 黒潮 “Kuroshio” (black tide) which we think is a very apt name indeed! The height and shape—slightly narrow at the rim—of this fuyu (winter) bowl keeps tea warm, an advantage in winter. 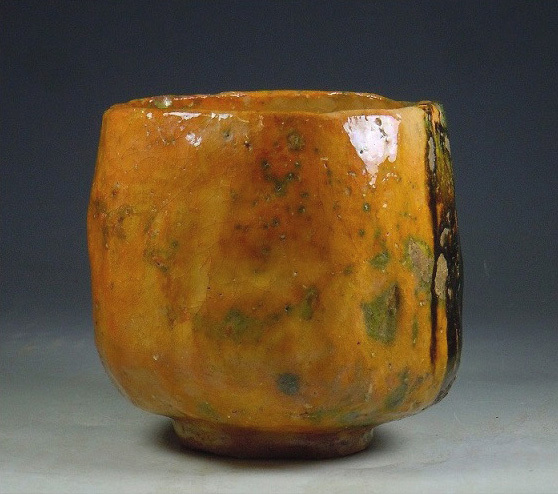 The texture of the chawan is wonderfully irregular and a delight to hold; smooth glaze but with innumerable bumps and hollows that are so beloved in hand-formed raku bowls. Condition: Very good. There are two minor nicks and/or glaze pops on the rim. Please see the photos. Please contact info@mizuya.com for additional photos.